The Minister of Women Affairs, Zainab Maina, on Tuesday stated that her ministry is doing everything possible to empower women at all levels for the good of Nigeria. The minister was speaking at the ongoing ministerial platform in Abuja. “We have recognized that our women are poor especially our sisters in the rural areas and we are working towards empowering [them],” Mrs. Maina said. She stated that within two years of the Goodluck Jonathan administration, over 5,000 women groups and cooperatives have received N27.2 million out of which 6, 000 jobs were created. She also said that the ministry gave support to five non-governmental organisations to the tune of N5 million to establish various economic ventures and employ over 1, 000 vulnerable women at the grassroots. Mrs. Maina also stated that her ministry distributed 2, 500 mama kits to various states during the ministry’s advocacy visits and established six different cottage industries in Akwa Ibom, Abia, Ekiti, Delta and Sokoto States to empower women in farming activities. 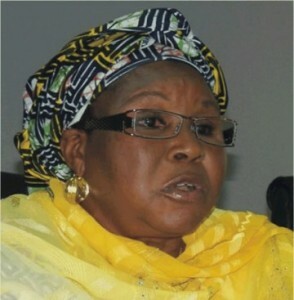 She said full services have commenced at the Kurudu Center for Women victims of Domestic Violence in Abuja. She also spoke on cooperation with South Africa on women development, child welfare, and support for persons with disability.